The Toronto trio’s third full-length delivers on the promise of their Hiding EP and expands their playbook in subtle ways. 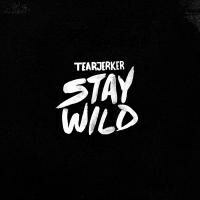 Those familiar with Tearjerker’s early albums like Strangers (2010) and Rare (2011), might smile at the band’s most focused and refined work yet being given the title Stay Wild. The reverb haze in which Tearjerker bathed their first records in began to recede on their dusty glowing Hiding EP – which, after initially being self-released, was picked up by the now defunct SQE Music and put out on 12” in May of last year – revealing more of the character at the core of Micah Bonte, Trevor Hawkins, and Taylor Shute’s songwriting. Stay Wild peaks in its final stretch, from the circular guitar riff meditation of first single “Obviously Wrong” to the touching, vulnerable sing-along “Heavy”. “Since the summer is the shortest season/It’s up to you and me to give it meaning”, goes “Perfect” in between. The patience that Tearjerker have shown in getting to this point, roughly five years on from their debut, shows they are likely less worried about the ticking clock itself than with making sure the time spent has all been worth it.